2How does Ostarine work in the body? 3What are the effects of Ostarine? 5What are the side effects of Ostarine? Don’t Want To Read? Watch The Video Version Of This Post Here. For a long time, S-4 or Andarine was believed to be the answer that researchers had long been seeking. The perfect selective androgen receptor modulator that could prevent muscle wasting and reduce the risk of benign prostatic hyperplasia. Phase-I Human clinical trials happened. The results were said to be extremely positive. And then suddenly, the trials were dropped in favor of a more ‘effective’ SARM, called Ostarine. For any chemical to have trumped something as potent as S-4, it’d have to be pretty dope. That’s precisely what Ostarine is. It is one of the most effective SARMS that you can use often called by bodybuilders as the perfect SARM. Something that’s as close to exogenous testosterone as it can get. In fact, most users compare the results with what you can achieve with EQ or Anavar clubbed with test. It also has the distinction of being the only SARM to have been researched multiple times on humans. But what does it bring to the table for an athlete, a bodybuilder or an amateur trying to break their threshold? Ostarine, MK-2866, GTx-024 or Enobosarm is a SARM that is developed and researched by GTx laboratories as a potential therapeutic aid to prevent muscle wasting caused due to cancer. As we briefly mentioned, it has been extensively studied by multiple research agencies. In fact, GTx still has studies underway on Ostarine after more than a decade and a half. That in itself speaks volumes about its perceived potential therapeutic uses. One day, it might replace a lot of side-effect inducing medicines that we use. But if not for the bodybuilding community, Ostarine would be an unknown research chemical at best. Bodybuilders started to tap into it way back in the early 2000s once the research data became public and since then, it has remained one of the most popular SARMS in the world. Professional sporting organizations along with WADA have banned Ostarine way back in 2008 labelling it an ‘S1 Anabolic Agent’. How does Ostarine work in the body? Ostarine binds to specific androgen receptors in muscle and bone tissues. Androgen receptors are programmed to receive information about steroidal hormones like testosterone, DHT and estrogen. By stimulating these receptors, Ostarine mimics the action of exogenous testosterone in the body. Think of it like a milder testosterone cycle without the estrogen and DHT related sides that most users are petrified of. It has excellent bioavailability much like its sibling, Andarine. Pretty straightforward if you ask us. Nothing fancy. Just a very effective SARM. 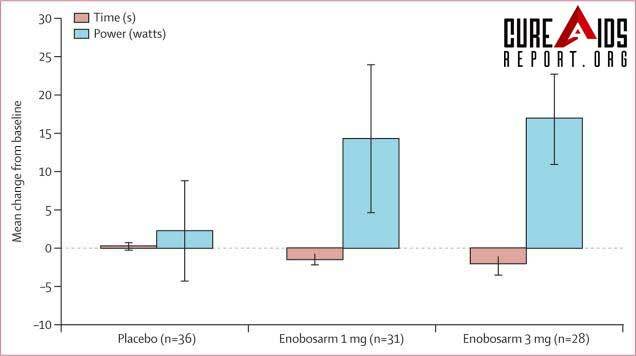 We recorded a significant increase from baseline to day 113 or end of study in mean stair climb power (stairs 1–12) among patients who received enobosarm 1 mg and enobosarm 3 mg, but not in patients assigned placebo (table 3, figure 2). Absolute changes in stair climb power represented a mean of 18·0% (SD 31·1) improvement compared with baseline for enobosarm 1 mg and 21·7% (65·7) for enobosarm 3 mg (vs placebo, 4·8% [SD 23·2]). What are the effects of Ostarine? Any chemical that is being researched for preventing muscle wasting and muscular dystrophy will find users and abusers who will use it for increasing muscle mass. That’s the most obvious effect of Ostarine. In a clinical trial that lasted 12-weeks, 120 healthy but elderly individuals were given a surprisingly low dose of Ostarine. They gained lean muscle mass and reported an overall improvement in their fitness levels. The dose was just 3 mg/day. Bodybuilders use up to 25mg/day and have reportedly gained up to 8 lbs. of clean, hard muscle in a 12-week cycle. That’s results that most people would live with any day. Another unique trait of Ostarine reported by users is that the gains that you make are more or less permanent. You will lose very little of what you gain during the 12-week cycle. That makes it one of the best off-steroid cycle drugs or post PCT supplements that you can use. With age, our bodies produce lesser and lesser testosterone which is bone protective. Ostarine helps improve bone strength and bone density which in turn reduces the risk of fractures. Ostarine helps to reduce LDL and Triglycerides. The only caveat is that it may also reduce HDL levels which is beneficial cholesterol. Having said that, in many steroid cycles, triglyceride levels are a major cause for concern. Cardarine can help complement such steroid cycles. Ostarine may one day be a safer alternative for anti-diabetes drugs like Metformin. It helps improve insulin resistance and reduces blood sugar levels. 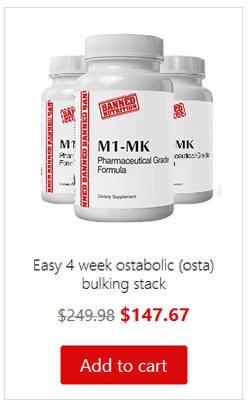 The recommended dose of Ostarine is 25mg/day for a bulking or a cutting cycle in men. Women can use a lower dose of up to 10mg/day. If you are on a body recomposition cycle, then a slightly lower dose of say 15-20mg/day might also suffice. Ostarine can be stacked with almost any other SARM or anabolic steroid due to its well-rounded profile. You can also use it as a PCT drug or in between steroid cycles to maintain the hard earned muscle. A typical Ostarine muscle building cycle lasts 12 weeks. There might be minimal suppression. But it’s not severe enough to warrant a full-fledged PCT. Having said that, the lack of sufficient data suggests that you can do a PCT with Clomid or Nolvadex just to be on the safer side. Also, if you are using extremely high doses like 40mg/day (not recommended) then you might want to club it with an AI like Arimidex, especially if you are sensitive to Estrogen related sides. What are the side effects of Ostarine? The side effects of Ostarine that have been reported by users are generally mild and temporary. Like back pain, low energy, headaches and nausea. Some women have reported menstrual imbalances at high doses. Others have had sporadic acne outbreaks. Ostarine is one of the most promising SARMS that have been discovered in recent times. Moreover, it fits right into just about any bodybuilding program. Be it a bulking cycle, a cutting cycle, a PCT cycle or body recomposition. It allows you to gain lean hard muscle that you can keep even when you discontinue the cycle. It boosts energy, improves heart health and brings about an overall improvement in your quality of life. And it can be stacked with other SARMS or steroids. The only thing worth a special mention is that Ostarine, like most other SARMS, should be purchased from reputed sources only. You want a trustworthy supplier who ships authentic Ostarine and not some liquid that’s laced with toxic chemicals or anabolic steroids. What is a good/reputable company to get this from? ?